Shortly after 2 o'clock Monday morning a gas explosion occurred at the home of William Schimmel at 420 North Church Street, which made a sad looking wreck of his fine home and nearly killed Mr. Schimmel and his wife. At about 2 o'clock that morning Mr. Schimmel awoke and smelled the escaping gas in his house and he called his wife. They got up and raised a number of windows and opened several of the doors and then went down [to the] cellar and opened the cellar door to let out whatever gas was in that part of the house. When he felt there was no more danger of an explosion, he lit matches and searched for a gas leak in the piping, and as he reached a point in the cellar where a wooden door led into the space under his sitting room, gas escaping through a crack in the door ignited and the explosion followed, throwing Mrs. Schimmel to the floor of the cellar and breaking her left arm. Both she and her husband had their faces badly burned and the wonder is that they were not killed. Mr. Schimmel carried his wife to the second story of his home and called in the neighbors to look after her. The sitting room floor was rent in thousands of pieces and fire set in. The fire department responded promptly and put the fire out. The ceilings and walls of the sitting room, dining room and parlor were badly shattered and windows and doors blown out. The front outside brick wall of the sitting room was blown down and the brick walls all around the house were cracked and bulged out. It appears the gas escaped from a weak joint at an elbow in the gas pipe under the sitting room of the house and that the gas had been escaping there for quite a time and so great was the amount stored there that when ignited it exploded with terrific force. Mr. Schimmel's loss will no doubt be at least $1500. It is a very serious loss to him, but he feels thankful that he himself and wife escaped with their lives. All day Monday hundreds of people visited the scene of the explosion and all expressed surprise at its seriousness and wondered that both Mr. Schimmel and his wife escaped with such slight injuries. One of Watertown's last veteran active cigarmakers, a man whole spent 64 years in the game, has retired. He stepped out yesterday from active business and has closed his West Main Street business place. The man is William Schimmel, head of the William Schimmel and Son cigar store, located at Main and North Water streets. He went to work for Wiggenhorn Brothers when he was but 15 years of age. It was considered the thing to do those days, to start work at an early age and learn a trade. 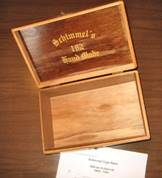 Mr. Schimmel learned the business from the ground up and became an expert cigarmaker and later went into business for himself. He started as a tobacco stripper and gradually got a place "on the bench" and daily made his share of cigars, back in the days when the cigar business in Watertown was booming. In 1908 he went into business for himself, first opening a place in West Main Street, where he remained for eight years, before opening the store which until yesterday housed his business. With Mr. Schimmel's retirement passes another link in Watertown's once famous cigar industry, when it had many local factories, employing several hundred cigarmakers. Among the cigars which bore the Schimmel mark were such favorites as the S and S, Havana Special, Juanita, and the noted 182. The concern also made cigars for special trade and concerns and at one time employed from 16 to 18 men in its shop. The formula for the Schimmel cigars never varied. He always insisted on the best and saw to it that his trade got it. The cigars turned out at his factory enjoyed not only a wide local sale, but popularity in a wide area and in many distant places. "Things have certainly changed a lot, especially in the retail line," Mr. Schimmel said today in announcing his retirement. "Why when I started in the business Watertown was known far and wide as a famous cigar city, and any young man who took up the business got into a fine field and learned a good trade. But things are different now. There is hardly any young man going into the game these days. Machine made cigars and the immense national sales campaigns by nationally circulated cigars have made a thing of the past for the smaller factories. Some day these may come back, but I doubt it. But it was a great business while it lasted. I am glad to have had a part in it in Watertown. We made many fine business contacts and I appreciate the years of support which our trade gave us. Now, I am ready to take it easy and loaf and enjoy a rest." Walter A. Schimmel, who has been associated in the business, will become associated with the Tri-County Tobacco Co., formerly the Miller Cigar company, in North Fourth Street. He will be the exclusive cigar salesman for the concern and will begin work in about two weeks. He plans to take a brief vacation. Among the cigars he will handle are La Fendrich, Mi Lola, Cremo, Greystone, Van Bibber, Seiderberg, Blue Spot, Blue Seals, Schimmel's 182 and Beachnut. The store building which Schimmels are vacating will probably be occupied soon by another concern. Several interests are negotiating for the place but no deal has been closed thus far. Mr. Schimmel recalled that Charles A. Kading, former congressman, bought the first box of cigars from him when he opened the business and he was also the last man to buy a box when Mr. Schimmel closed out his stock. William Schimmel, 83, former cigarmaker and cigar manufacturer, died here today at the home of his son, Clarence Schimmel, 119 North Washington Street. His death followed an illness to which the infirmities of age contributed. Mr. Schimmel retired from the cigars business in 1937. He was a native of Germany and was born July 24, 1858, a son of Mr. and Mrs. Christ Schimmel. 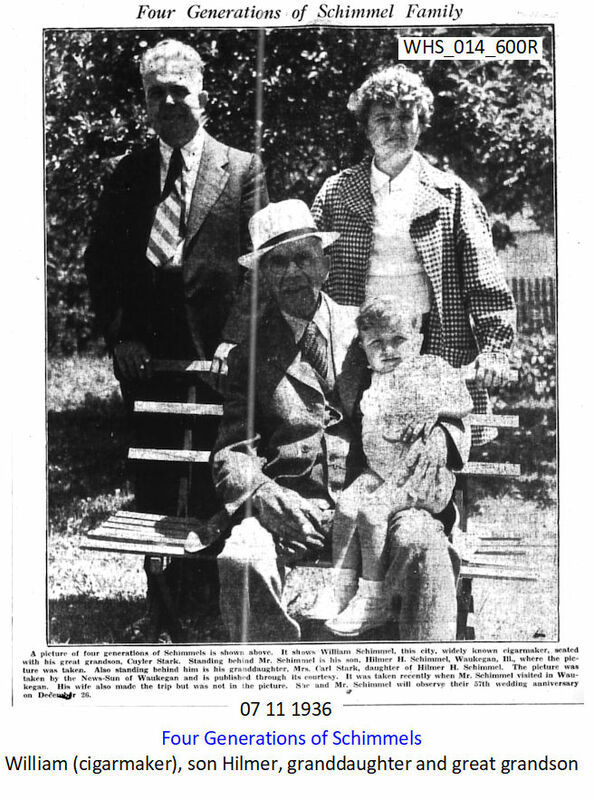 They came to the United States when he was a boy of 12 and soon after settled in Watertown. This had been his home ever since. He married Miss Emma Speer on December 26, 1880. She died on September 10, 1938. Surviving are three sons, Walter and Clarence, this city, and Hilmer, Waukegan, IL. Another son, William, died in 1925. Two sisters also survive, Mrs. Minnie Fischer, Boston, Mass., and Mrs. Dora Everson, Chicago. Two other sisters and one brother preceded him in death. Mr. Schimmel was a member of the Plattdeutscher Verein. He served several terms as alderman from the old Fifth ward and was a charter member of the Cigarmakers Union here and served as its president. The funeral held from the Hafemeister funeral home. The Rev. C. W. Pinkney of the First Congregational church will officiate. Burial will be in Oak Hill cemetery.